Enjoy this 8, 15 or 30-minute helicopter flight as you take in panoramic views over the iconic Kings Canyon. See the domes of the Lost City, the Garden of Eden, Kings Creek and over to Carmichael Crag as you glide over the incredible outback Australia. With most of these picturesque locations being inaccessible by ground, your 8 or 15-minute flight will give you uninterrupted views of this stunning location and an experience you are likely never to forget. 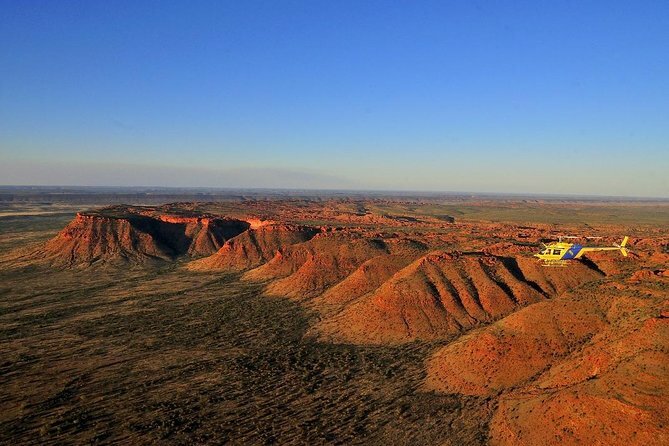 Discover the natural beauty of the Northern Territory as you travel by air-conditioned helicopter over Kings Canyon, the domes of the Lost City, the Garden of Eden, along Kings Creek and over to Carmichael Crag. During the flight, your pilot will point out the incredible scenery along the way. This 8-minute or 15-minute experience provides you with uninterrupted aerial views you will never forget. In Watarrka National Park, travel over the domes of the Lost City, a natural formation of sandstone towers before gliding over the Garden of Eden, a natural waterhole with an incredible Indigenous history. Make sure to bring your camera as you fly over Kings Creek and over to Carmichael Crag for incredible views out over this impressive landscape. The sky will come alive with incredible colors as you fly over the mix of rugged bushland and red sand desert. Your pilot will return you to Kings Canyon at the end of your flight.